Financial Reporting for Business and Practice 2004 is the definitive text on financial accounting. 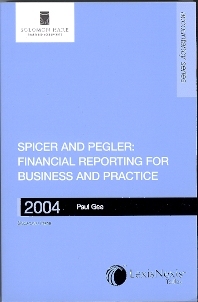 First published over ninety years ago as Spicer and Pegler’s Book-Keeping and Accounts, this updated edition contains worked examples and illustrations from published accounts of small and medium-sized enterprises, giving a clear insight into the most recent developments. This book includes an update on IAS developments, including the Accounting Standard Board’s programme for converging UK GAAP with IAS. The chapter on revenue recognition has been updated to cover recent developments such as Application Note G to FRS 5. Other chapters deal with the UK regulatory framework; statements of principles and accounting policies; revenue recognition; reporting the substance of transactions; tangible and intangible fixed assets; accounting for liabilities and provisions; hire purchase and leasing; shareholders’ funds; financial instruments; taxation, including deferred tax; retirement benefits; share-based payment; directors’ remuneration and share disclosures; accounting for small and medium-sized companies; limited liability partnerships; accounting for overseas operations; and reporting issues for listed companies. This text is ideal for corporate financial professionals, smaller practitioners or students looking for a convenient and practical reporting handbook. Related party transactions, contingencies, commitments and post balance sheet events.